Ear infections are caused by a bacteria or virus in the middle ear and can be painful due to inflammation and a build-up of fluids. Colds, flu, and allergies can bring on an ear infection due to the congestion and swelling of nasal passages, throat, and Eustachian tubes. If you have kids, it’s likely you know a thing or two about ear infections. 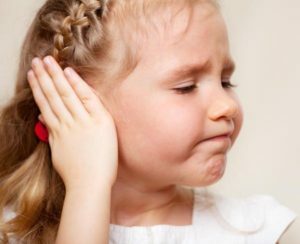 In the United States, five out of six children experience an ear infection by three years old. Luckily, there are non-drug treatments for this common condition. Read on to learn about how chiropractic can decrease ear infections. Unfortunately, there are side effects associated with short and long-term antibiotic and NSAID’s or nonsteroidal anti-inflammatory drug usage, and it’s best to use them as sparingly as possible. Usually, ear infections clear up on their own, so low intervention is often the best route to take. Medical doctors will sometimes recommend antibiotics, especially for infants and in severe cases, NSAIDs to relieve pain. Developing research and studies do indicate a connection between ear infections and chiropractic care. Popular pediatric doctor, William Sears, MD, highly recommends utilizing chiropractic treatment for improving middle ear drainage and decreasing ear infections. Many parents bring their children into our office asking us to treat their ear infections. My first response is that the purpose of chiropractic care is not the treatment of conditions or diseases; rather, it is the restoration of normal body function. I explain that as chiropractors, we work with the nervous system via gentle spinal adjustments. We reduce stress related interference to the nervous system, thereby enhancing all overall body function. I further explain that all systems of the body—muscular, glandular, respiratory, circulatory, digestive, eliminatory, hormonal, and immunological—depend on the optimal function of the nervous system. With chiropractic, we focus on nerve system function to enhance all the body’s systems. Even the American Academy of Pediatrics recommends a watch-and-wait approach, because the evidence-based research about antibiotics is showing that not only are they ineffective at treating ear infections, but they will actually lead to repeated ear infections in your child. In a 1996 study, forty-six children under the age of five received regular chiropractic adjustments to treat ear infection symptoms, and researchers found that 93 percent of all episodes improved, 75 percent in 10 days or fewer and 43 percent with only one or two treatments. Contact Us (859-727-6888) for more information! Unlike conventional medicine, which focuses on attempting to treat disease once it occurs, All Star Chiropractic and Rehabilitation emphasizes improving your health in an effort to reduce the risk of pain and illness in the first place. Most people would rather be healthy and avoid illness, if they could. This is one of the main reasons for the big surge in the popularity of our wellness center.